If you want to do a little more than just acknowledge the event, why not throw him a birthday bash with all of his favourite doggy friends? Here are some ideas for making his day extra special — make sure you take lots of photos so you can savour the precious. Musical sits — place some hula hoops or dog beds around your garden (one less than the number of doggy guests). The dogs and their owners walk around in a circle and when the music stops, everyone rushes to get their dog to sit in a hoop or lay in a bed. The guest without a hoop or bed is out, and the number of hoops or beds is reduced for each round until there is a winner. Hot dog bobbing — place hot dogs in buckets or bowls of water (one for each guest) and have a race to see which dog gets his hot dogs out first. This is great if it’s a warm day and you want to keep your dog cool. It’s best if you don’t fill the buckets or bowls with too much water. Paddling pool rally race — split your guests into two teams. Place two paddling pools filled with equal amounts of toys at one end of the garden, and two jumps halfway up the garden. The two teams go head to head, and each team member takes it in turns, going over the jump, collecting a toy from the paddling pool, and bringing it back. The first team to bring back all the toys, wins! It may be easier to keep your dog on a lead and run with him. Florence & The Machine — ‘Dog Days Are Over’. Elvis Presley — ‘Hound Dog’. Baha Men — ‘Who Let The Dogs Out?’. Kate Bush — ‘Hounds of Love’. David Bowie — ‘Diamond Dogs’. Donny Osmond — ‘Puppy Love’. 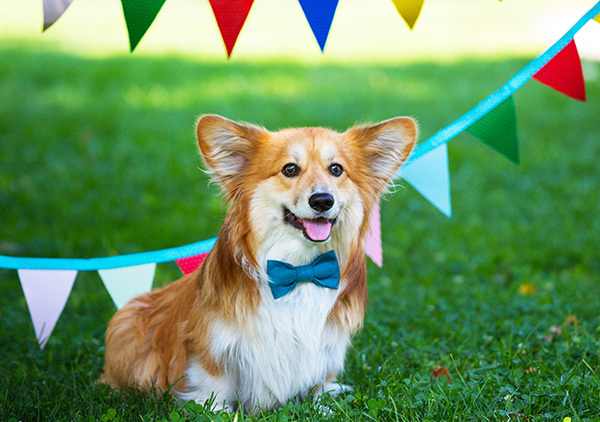 If you’re lucky enough to have a reasonable-sized garden and warm weather, having a party outside is probably the best option — but make sure your garden is dog-proofed. Also consider how many guests you would like to invite, and whether you can safely accommodate them. 400g (14oz) wholegrain spelt flour. 200g (7oz) turkey or chicken liver. Wash the liver and chicken, pat dry with kitchen towel, and fi nely purée in a food processor. Beat the butter until it’s fluffy, and then fold in the eggs. Stir in the liver and chicken. Next, mix in the flour and baking powder and, finally, stir in the carrot juice. The mixture should have a slightly liquid consistency. If it’s too runny, add some more flour; if too firm, thin with either milk or carrot juice. Grease a 26cm (10in) round cake tin, pour in the dough, and smooth flat. Bake for 40 – 50 minutes in a preheated oven (fan-assisted oven 160ºC, conventional oven 180ºC). The cake can be stored in the fridge for two to three days, but ensure it’s at room temperature before serving. You could decorate it with some of your dog’s favourite treats, which can be stuck on with cream cheese.